Cruise aboard the premium Vasco da Gama boutique sized ocean liner from Adelaide around Australia’s southern waters to experience ports of call in Kangaroo Island, Port Lincoln (Eyre Peninsula) and Wallaroo (Yorke Peninsula). 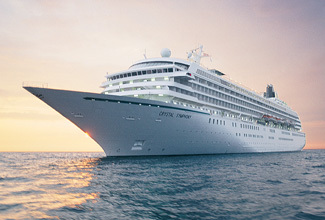 The premium Vasco da Gama boasts contemporary stylish facilities throughout this boutique sized ocean liner, with a relaxed classical style of cruising incorporating plenty of activities and a wide range of impressive entertainment options. Enjoy your luxurious from Adelaide to the Spencer Gulf. Sail along South Australia’s rugged coast with ports of call in Kangaroo Island, Wallaroo and Port Lincoln. As with all Vasco da Gama cruises, you can choose from a range of optional shore excursions in our ports of call of Kangaroo Island, Wallaroo and Port Lincoln, simply explore these beautiful destinations on your own or make use of the Vasco da Gama’s on board facilities and activities admiring the coastal landscapes from the deck. The choice is yours. We have a port of call in Port Lincoln on the spectacular Eyre Peninsula. Australia’s seafood and aquaculture capital, Port Lincoln is home to the country’s largest commercial fishing fleet and renowned for its southern bluefin tuna, King George whiting, Western King prawns and Southern Rock lobster. It is situated on Boston Bay – one of the largest protected natural harbours in the world and three times the size of Sydney Harbour. Boasting some of the most sought after seafood in the world Port Lincoln is a culinary tourist’s dream. The port of call in Penneshaw is the gateway to remarkable Kangaroo Island. Brimming with native animals, some of which aren't found anywhere else, it is also home to a renowned artisanal food scene. More than one third of the island is protected by conservation areas and national parks, while lush farmland and small towns make up much of the rest. Kangaroo Island, known to the locals as "KI", is Australia's third-largest island and is located 70 miles southwest of Adelaide in St Vincent Gulf. For customers travelling from Perth, the package is 12 days in duration, travelling Adelaide to Perth on the Indian Pacific and staying 2 nights longer in Adelaide. The Indian Pacific to Adelaide with Kangaroo Island & Southern Icons Vasco da Gama Cruise is very popular. Many dates book out well in advance, please book soon.